With rapidly increasing demand due to increasing energy prices, there has been an explosion in the number of ready-to-use energy storage systems available. We take a look at the options available. With the steadily rising cost of grid electricity, more and more people are looking to make the best use of the solar electricity they generate to offset as much mains grid power as they can. While there are a number of ways to do this, including shifting loads to the middle of the day or diverting excess energy to heavy loads such as an electric water heater, if those options are not possible or desirable, or you have other needs, such as a degree of backup during grid failures, then an energy storage system is an option. There has been a move in recent years towards storage systems that contain the batteries and other components in a pre-configured ‘storage in a box’ module for connection to a PV array. These sorts of pre-configured energy storage systems are the focus of this buyers guide. We do not cover individual batteries/cells in this guide, as they have their own buyers guide, the most recent in ReNew 131. There are several advantages to this sort of ‘storage in a box’ system. Firstly, installation is usually quick as much of the wiring between components has been done. Secondly, it often makes for a neater system as many components and their associated wiring are enclosed in a single cabinet. There are some disadvantages too, including less flexible system sizing—most suppliers have a few standard battery bank sizes that they offer. However, storage units may be modular so that multiple units can be used to make up the required capacity, and some are designed to have extra battery modules slotted into the case to increase capacity. 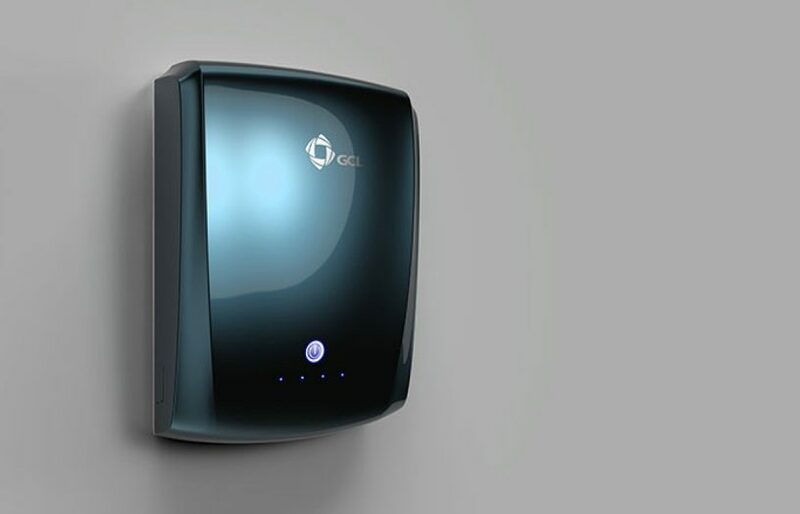 For off-grid systems, it’s critical to have enough energy generation and storage to meet your needs, so these are more likely to be of the traditional type with a separate battery bank and other components, unless your needs fall within the specifications of one of the pre-configured boxed systems. One situation where a prepackaged system may be useful in an off-grid system is for adding extra storage to an existing system by AC coupling storage to the system. For on-grid solar systems, energy storage may or may not be economically viable when you factor in the cost difference between off-peak and on-peak power, feed-in tariffs versus cost of electricity, the cost of replacement batteries and the system maintenance required. Renew (formerly ATA, Renew magazine’s publisher) regularly reviews battery economics and currently advises it may become economically attractive in a couple of years. Renew has developed a simple online calculator to assist with assessing the economics for your situation. While it is well understood that installing solar panels is positive for the environment, buying a storage system isn’t as advantageous. As we explained in ‘How green is my solar’ in ReNew 135, which considers the environmental credentials of both solar and batteries, adding batteries doesn’t increase your net impact on reducing fossil fuel generation. While you’re importing less from the grid at night, you’re also exporting less during the day. A recent study published in Nature in January 2017 found there is no environmental advantage to installing storage at the moment, given the low percentage of renewables on Australia’s energy grid; it actually comes with a small environmental penalty. This will change as the grid shifts towards renewables, meaning that the efficiency losses of charging and discharging batteries will have a decreasing greenhouse emissions cost (paper at go.nature.com/2kMfyGA). However, adding battery storage may benefit your local community. Drawing from batteries in the early evening reduces your demand on the grid at a peak time, which helps your electricity supplier delay expensive capacity upgrades. Also, power line voltage in some streets rises when everyone is exporting from their solar systems at the same time. If the voltage gets too high, solar systems cannot export and solar generation is wasted. Battery systems help your exporting neighbours to share your local infrastructure. One huge potential advantage of distributed energy storage systems (i.e. the installation of hundreds or even thousands of domestic-scale storage systems) is that of providing grid stability as more renewables come onto the grid. 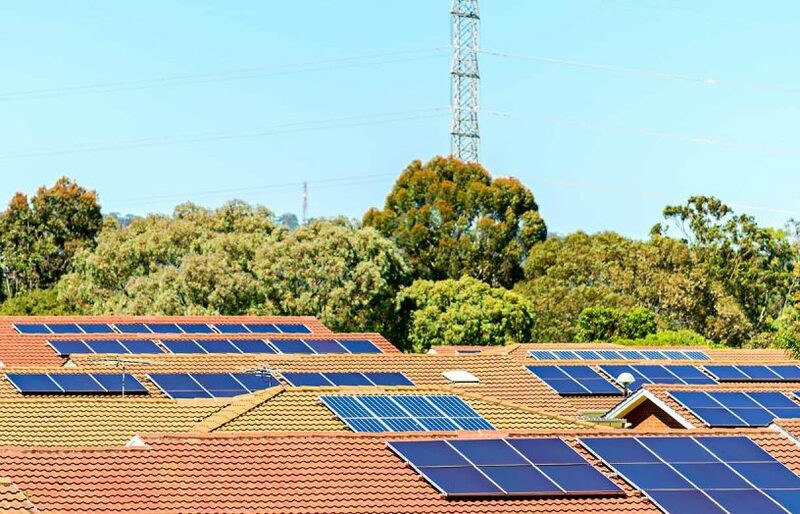 A trial of such a ‘virtual power plant’ is underway in the northern Adelaide suburb of Salisbury, where 100 Tesla and Samsung batteries have been installed on household solar systems. By giving SA Power Networks some control over the battery to use some of their storage energy to address network issues, these battery owners have effectively created the equivalent of a 300 kVA diesel generator in generation capacity. The trial will run for around three years to test how solar/battery systems perform under different conditions, including heatwaves in summer and heavy-cloud during winter. Energy storage systems come in a wide variety of capacities and designs, and several cell chemistries. 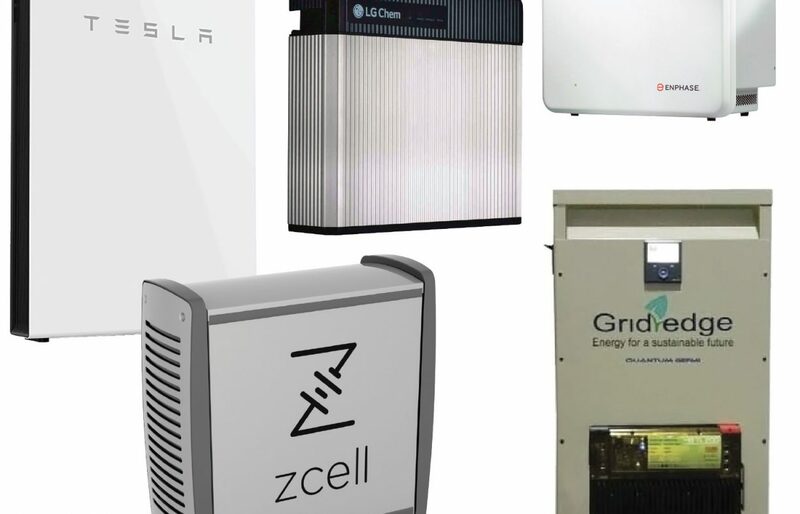 Here we have, from top-left, the Tesla Powerwall 2, LG Chem RESU, Enphase AC battery, GridEdge Quantum and the RedFlow Z-Cell zinc-bromide flow cell battery. Grid-connected batteries can be classified according to what’s included and how they connect to a solar system. There are three main groups: AC batteries, battery-only products and all-in-one units. Products such as the Tesla Powerwall 2 and Enphase include an inverter in the same box as the battery. Electricity flows in or out of the box at 230 volts alternating current (AC), the same as your house wiring. The product is connected to your existing house switchboard, separately from the solar panels and solar inverter. Such ‘AC coupling’ makes for an easy battery installation or retrofit to an existing solar system. The battery can be located far from the solar inverter, for example in a cool location to maximise battery lifespan. All batteries must be charged with direct current (DC). When an AC-coupled system is charging the battery, first the solar inverter converts the solar panels’ output from DC to AC, then the battery inverter switches it back to DC again. Each step results in some energy loss, so an AC-coupled system’s overall charging efficiency is generally lower than for a DC-coupled alternative (see below). On the other hand, much of the time your solar panels’ generation is not stored in the battery, but is instead used immediately by home appliances or exported to the grid (when the battery is full). In this case there is only a single conversion in the solar inverter, which tends to have very high efficiency. An AC-coupled system includes two inverters whose output may combine to help power appliances. For example, if during a sunny spell your solar inverter is producing 3 kW of power and your battery inverter has a capacity of 4 kW, you can run appliances with a total power of 7 kW without importing from the grid. However, having two inverters can also complicate grid connection. Your local electricity distributor will have rules limiting solar system size. These rules may be based on the system’s total inverter capacity, including both the solar inverter and battery inverter. Products such as the LG Chem RESU 10 and Fronius Solar Battery don’t include an inverter. They include the battery and supporting components such as safety switches, cooling devices and battery management system (BMS, see ‘Specifications and terms’ for definition). The box is connected with cables carrying DC current at a suitable voltage for the battery, typically 48 volts but sometimes at a level similar to a string of solar panels, e.g. 400 volts. This is known as DC coupling. The cables may also contain wires communicating information such as the battery’s state of charge. These products must be connected to a compatible inverter or charge controller. Typically they are connected to what’s called a ‘hybrid inverter’, which acts as a normal solar inverter but also includes a charge controller allowing connection of a DC-coupled battery. For example, the Fronius Solar Battery is only compatible with Fronius hybrid inverters. Typically the battery is located directly below the hybrid inverter. These batteries can often also be installed in other situations, for example AC-coupled or off-grid. With DC coupling, the cable from the roof feeds a charge controller which regulates the panels’ DC electricity to a voltage and current suitable for the battery. A single inverter is included, supplying 230V AC to the house switchboard. 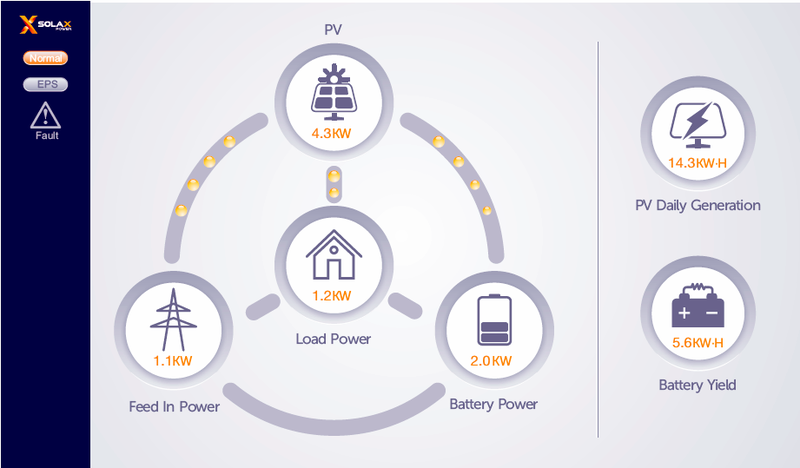 A common misconception says that in a DC-coupled system all solar generation must run through the battery, incurring additional losses due to battery round-trip efficiency. In fact if you’re running appliances while the sun’s shining, they will be powered directly via the charge controller and inverter. Current can flow via the battery terminals without entering the battery. Alternatively a hybrid inverter might bypass the charge controller altogether and operate like a normal solar inverter. Some distributors allow the connection of large solar systems but impose an export limit. For example they’ll allow 8 kW of panels feeding an 8 kW inverter, but only if you install a device limiting export to the grid to a maximum of 5 kW. If your generation exceeds consumption by more than this limit, the surplus solar electricity from the inverter is wasted. Either an AC-coupled or DC-coupled battery can store this type of surplus. Products such as the Alpha ESS Eco and Sunverge SIS contain the entire solar-battery system except for the solar panels. Inside the box, the battery may be DC-coupled (see above) but is more likely AC-coupled. The product is connected to your switchboard using standard household wiring: 230 V AC. All-in-one units allow for fast, neat installation, especially for new solar systems or retrofits where an old solar inverter will be replaced. However, they are physically large, often approaching the size of a fridge. Some systems include an LCD to give you instant information on system status. This is the 7” display from a SolaX unit. 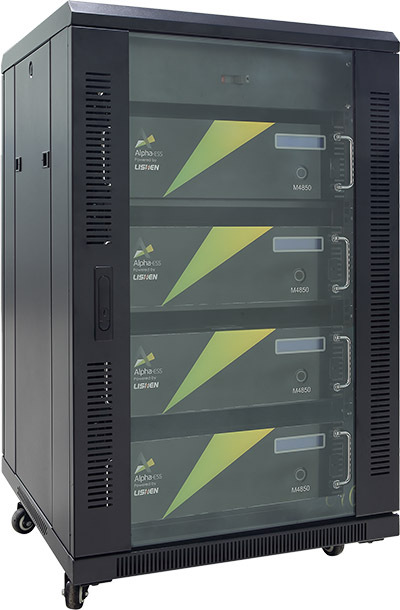 One factor to consider when looking for a storage system is whether you want backup power available when the grid is down, often referred to as uninterruptible power supply (UPS) capability. If blackouts are a rarity then you might not consider this ability important, but if your grid supply is less stable or you have devices that need to stay running, then UPS capability may be a high priority. Not all storage systems are designed to provide energy when the grid is down and this may depend not just on the storage system but also the rest of the system design and which inverter is used. Also be aware that some storage systems may be relatively limited in output. While you won’t notice this when the grid is available, when the grid is down and the battery has to supply all electrical needs, then any limitations may be an issue. You need to ensure that the storage system you are looking at can provide any likely loads during a mains grid failure, or have one or two lower load circuits wired (such as lights and the circuit for the phone/NBN gateway, for example), so that only they will run on the battery during a grid failure. Your electrician/installer will be able to provide you with more guidance; just make it clear what your requirements are when looking for a system. Your preference of battery chemistry will affect which systems are available to you. There are now numerous battery chemistries and types available. Lead-acid batteries is a tried and true technology for domestic energy storage, particularly in off-grid systems, but many new system-in-a-box systems are now using one of the lithium-based chemistries, such as lithium iron phosphate, which are maintenance-free and are cared for by the system BMS, making their use quite simple. While lead and lithium batteries are the most common, there are some new types of batteries that have hit the domestic energy storage market more recently. An example is the zinc-bromide flow battery, the most well-known of which is the Redflow. Flow batteries use tanks of liquid electrolytes which are pumped through a cell stack to produce electron flow. They can have long cycle lives, but require a regular maintenance cycle that takes the battery offline, and can have a lower round-trip efficiency compared to other chemistries. Sodium nickel chloride is another chemistry that has recently appeared in the form of the FIAMM SoNick batteries used in the GridEdge Quantum storage system. These are high-temperature batteries using relatively benign chemical components, with good energy densities. One particularly benign battery technology is the sodium ion, or saltwater battery. The only manufacturer of these, Aquion Energy, recently underwent Chapter 11 bankruptcy but have come out the other side and are in the process of redesigning their cells for future release. For more information on battery chemistries and technologies, see ‘The lowdown on battery technology’ in ReNew 137. One concern over the newer battery technologies such as lithium ion and flow batteries is that they have an unknown lifespan. However, flow batteries have been in use in commercial-grade storage systems around the world for years, while lithium cells are found almost everywhere and have proven to be rugged and reliable when treated correctly. Experience in electric vehicle use so far implies they will have very long lifespans, so there is no reason to believe that lithium batteries (especially LiFePO4 batteries, which are considered the most robust of the lithium chemistries) will not perform as expected in household use. Systems using any of the currently available technologies should provide battery lifetimes of six to 10 years provided that the system is appropriately sized to the intended usage and load profile (how much energy is used, and when). Each system listed in this guide specifies the available storage capacity, and suppliers should be able to provide estimated battery lifespan versus depth of discharge information. Batteries are not the simple devices they once were. Many storage systems contain considerable processing power combined with algorithms that allow them to make the best of the energy available, based on predicting energy consumption patterns from past usage and external data, such as wholesale electricity prices and weather data. Some systems can use local weather data from online weather services to predict how much solar energy is likely to be available the next day and then charge the battery from the grid overnight if solar energy input is likely to be low. By combining this sort of data, the battery will decide when it should be charging and discharging to make the most effective use of the available solar energy as well as minimising grid import (and export, if feed-in tariffs are low). Even for storage systems that don’t have these features built in, add-on systems like Reposit can provide this sort of functionality (see www.repositpower.com/compatible-batteries for a current list of compatible systems). In recent times it has become possible for individuals with domestic-scale energy systems to sell their excess for higher prices at times of high demand. Currently, the only way to easily do this is to use the Reposit Power service in conjunction with a retailer supporting the system. The retailer agrees to pay a higher price for energy from your battery under certain grid demand conditions—for example, the retailer pays $1/kWh for exports from the battery during what is called a ‘grid event’, when the spot price is high. The Reposit system consists of a small energy meter fitted to your meter box, plus the Reposit app and a Reposit-compatible storage system. Storage is also being used in a few trials around Australia to supply support to the grid at times of high demand or generation fluctuations, including the AGL trial of 100 systems in Adelaide, mentioned earlier, and the AusNet minigrid trial at Mooroolbark, VIC, where 14 homes have their own 10 kWh storage units, as well as a separate storage and stabiliser that allows the entire group of homes on the minigrid to run independently of the grid for short periods. Energy storage systems can be a fire hazard under certain conditions, such as a control systems failure due to a lightning strike or a cell short circuit. Commercial storage systems are generally designed to handle such problems, but should a fire eventuate, then the system must be installed in a manner that prevents the battery fire posing a hazard to the home or occupants. With the proliferation of new battery types and the rapid uptake of storage systems for domestic dwellings, it was recognised by Standards Australia that the existing storage system standards did not cover the wide variety of storage system types, nor the likely installation scenarios possible, so a new standard, AS/NZS 5139:2017 (currently in draft form), is being devised. This is a revision of AS4086.2-1997 and will cover all domestic storage systems where a battery with a nominal voltage of 12 VDC or greater and capacity greater than 1 kWh and less than 200 kWh is connected to power conversion equipment. It will not cover electric vehicles, portable equipment or UPS systems that comply with AS62040. Battery types covered are lead-acid, nickel-cadmium, flow batteries, hybrid ion and all lithium ion chemistries, while hazards covered are electrical, energy, fire, explosive gas, chemical and mechanical hazards. Note that the standard is a work in progress, and the draft released in June for review by the industry attracted much negative response regarding the requirements that all lithium-based storage systems be installed outside, not in or underneath a home, and require a fire barrier that extends 600 mm either side and two metres above the storage system enclosure if systems are installed within one metre of the dwelling. As a result, Standards Australia have paused development of the standard to allow some fundamental questions about the scope of the standard to be addressed. It should be remembered that the safety risks associated with actual cell chemistries differ depending on the chemistry. Lead-acid batteries can vent hydrogen gas, which is explosive and must be vented outside (this is covered in existing installation standards). Lithium ion batteries can catch fire, but lithium iron phosphate batteries are considered far less of a risk in this regard. For chemistries that are more susceptible to potential fires, the risks can be managed with a good BMS, cooling system and enclosure design. Quality is important, especially in energy systems which must be safe and reliable. It can be difficult to assess, however, given the fast-moving nature of the battery storage market. It’s early days and most systems have little track record as yet. One option is to look for a track record in other regions or markets. The issue of installation is equally important. Use only accredited installers with the appropriate qualifications, and ask if you can talk to some of their previous customers for references. To find a local installer check out the Clean Energy Council’s accredited installer page at www.bit.ly/CECFAAI. For on-grid systems, the capacity required will depend on how long you need (or want) to run your house without mains power or, if you are primarily using the system for avoiding export or load shifting, how much energy you want to shift. 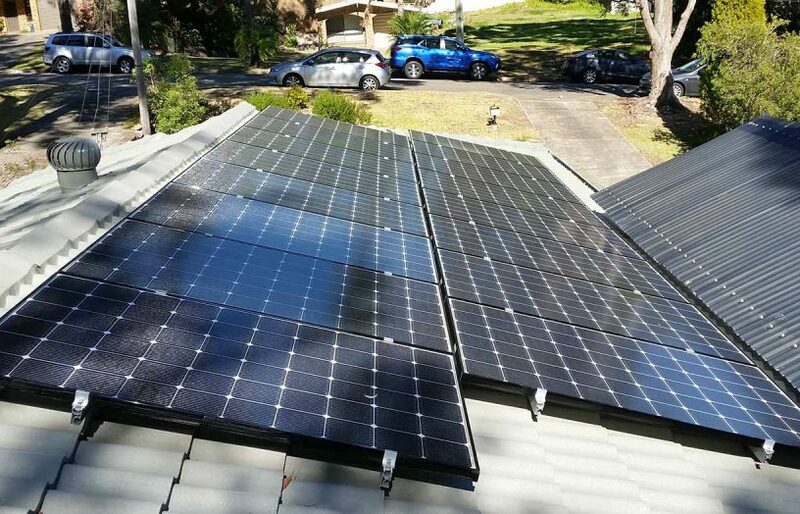 You should also take into account any changes you might want to make further down the track, such as switching from gas hot water to electric heat pump, for example, or adding more PV panels in the future to cover the needs of a growing family. The main specification to consider for sizing is usable capacity. Usable capacity is that part of the total battery capacity (often called the actual or nominal capacity) that the manufacturer recommends you use each cycle for the rated cycle life of the battery. For example, if a system is rated at 90% depth of discharge (DoD) and has an actual battery capacity of 12 kWh, then for each cycle you can only use 90% of that, or 10.8 kWh. Some batteries, such as the Redflow flow battery, allow a full 100% of capacity usage per cycle, while others will list a maximum usable capacity which will be less than the nominal or actual capacity. It is this usable capacity figure that should be used when sizing a system. Another figure to check is the maximum power the battery (or battery/inverter combination) can provide. Some are quite limited in their output power, so if you need to power a large load from your battery then you must select one with a suitable output rating or use more than one to achieve the required power capability. Renew’s online solar advice software or paid advice can help with determining system size and the payback time. The final system design should be done by a qualified solar/battery installer. You can find your local installers here. Off-grid systems must be sized to meet all electrical loads and to provide the appropriate number of days of backup for periods of low energy generation (such as cloudy days in winter). See ‘Off-grid Basics’ in Renew 128 for more information on this. Some systems, such as the Alpha ESS (the PowerPlug battery-only version shown here), are modular and can be expanded later by adding more battery modules, so you can start small and add storage as you see fit. While some system owners just want their system to sit there and do its thing, many prefer to be a little more hands on, knowing what the system is doing and its general status, and maybe even logging this information over time to see how the system has performed. At the very least, a system owner should check periodically that the system is working as expected, with any problems or system errors investigated as soon as practicable. Recording system data can be done in a number of ways. Some systems have inbuilt interfaces to allow them to upload data to the manufacturer’s (or sometimes a third party) web portal, for viewing in real time. An example of such a portal is Enphase Enlighten, which can record and display a range of information, such as energy generated, energy consumed, energy exported, including on a monthly, daily and even hourly basis, as well as providing reports. Many systems also have apps that allow you to monitor and interact with the system in real time. An alternative method of data collection is to use a third-party portal, the most popular of which is PVoutput.org. Some systems can upload data directly to PVoutput, while others will require an additional interface of some kind. It varies with each portal, system and equipment installed, so if monitoring is important to you, then ask the supplier or installer what capabilities your potential system has in this regard. 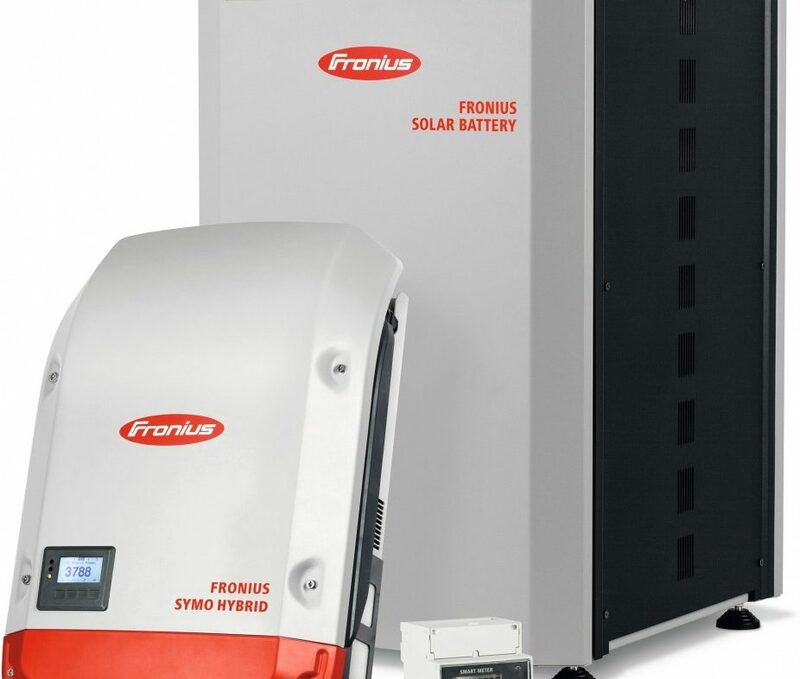 Some storage systems, such as the Fronius Solar Battery, are designed to interface directly with inverters from the same manufacturer, and will often be available in a complete package of storage, inverter and monitoring system. Adding a new storage system to an existing renewable energy system will depend on the existing system and the components used. Often, the original system will be a simple combination of solar array and grid-interactive inverter. In this case, an AC-coupled storage system is usually the simplest solution as the batteries can run independently of the inverter. If the existing inverter has the ability to communicate with particular storage systems or additional control systems, then this can give added functionality to the resulting system. If your existing solar inverter is at end of life, then you might prefer to replace the inverter with a hybrid inverter and install a DC-coupled system. This has advantages in efficiency and for oversized systems, as discussed previously. 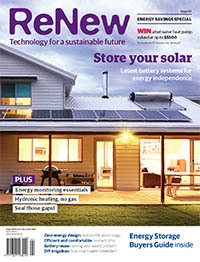 See ‘Just add batteries’ in Renew 137 for more on retrofit considerations. As you would expect, system warranties vary by supplier and component, but you should look for at least five years on the storage system. If the system includes an inverter and other equipment, the warranty may vary for each component, so check this. Battery lifespan is likely to be more than the warranty implies, provided that the system has been correctly sized and the system is used within its recommended cycle depth and frequency ratings. Because most of the system is pre-configured and the batteries are normally low maintenance or maintenance-free, there is not much to do to look after your system. Each finished installation should come with instructions on any maintenance or checks that need to be done, such as keeping system cabinets clean and free from insect and animal infestation. With internet connectivity of the system, the owner may not need to concern themselves with monitoring at all. The system supplier can simply take a look at the system remotely and check for any problems that may be occurring. Minor glitches may even be able to be fixed remotely, without the cost of a site visit. Such are the advantages of modern communications technologies! System upgradeability depends on the system itself—some are modular, and you can double system capacity just by adding another module. If you are planning to extend the system in the future, ask about this ability. Different battery types and even batteries of the same type but different ages often can’t be connected together on the DC side, although some systems, such as the Sonnen Storage System, are modular and can have batteries of different ages mixed. However, no such limitations exist for AC coupling, as each storage component is treated separately by the system. For an example of adding storage to an existing system, see ‘Powering up: adding extra batteries to an off-grid system’ on page 78. As battery technology is entering a new phase of rapid development, the batteries your system comes with may be obsolete when they are due for replacement. Given that most systems have a rated lifespan of at least 10 years for the batteries, then it is likely that the entire storage system will be replaced at end of battery life, rather than having new batteries fitted. However, some systems can have new batteries fitted easily by swapping out battery modules, which may make replacement at the end of the battery life cheaper. For the abbreviated table of storage systems in PDF format, click here. The data in this table has largely been taken from the regularly updated energy storage systems table put together by Solar Quotes. Consequently, the data here may not be as up to date as the Solar Quotes online table, as specifications are constantly updated by manufacturers. The data here should be used as a guide only. IP (International Protection, often called Ingress Protection) ratings describe the level of dust and water ingress protection. The first number is dust protection, with any number including or higher than 5 meaning the unit is dust protected. The second number is liquid protection, with any number including or greater than 4 meaning it will withstand all likely outdoor scenarios. For a complete explanation of the IP rating system see en.wikipedia.org/wiki/IP_Code Pricing generally doesn’t include installation, except where stated. However, prices change regularly so check the updated table at Solar Quotes for current pricing. For the full Solar Quotes table of storage systems, click here. Lance Turner is technical editor at Renew magazine. A lot has been said about the environmental impacts of materials used in batteries, particularly lithium and cobalt. Lithium has limited sources, most lithium coming from South American countries Bolivia, Chile and Argentina. There are, however, other sources of lithium, including Australia, and a new lithium mining method developed by Simbol Materials in the USA extracts lithium and other metals from waste brine from geothermal power plants. Lithium typically makes up a fairly small percentage of a lithium ion battery by weight—between 2% and 5%, depending on the battery chemistry and who you ask. Around 60% of the world’s cobalt comes from the Congo and is ethically doubtful due to the use of child labour in the mining process. However, not all lithium battery chemistries require the use of cobalt, so if this concerns you then look for a cobalt-free chemistry such as lithium iron phosphate. Older battery chemistries also have issues, such as lead-acid, which contain large quantities of lead, a toxic metal. Fortunately, lead-acid batteries are almost entirely recycled here in Australia, with collection facilities widespread. However, lead mining has had its own fair share of problems, with lead contamination in mining towns being well known in some parts of Australia. Some battery chemistries, such as the sodium ion battery, are more benign, with their materials being common and generally non-toxic, but there are limitations and considerations present for all battery chemistries to some degree. The battery industry as a whole seems aware of these issues and a great deal of work is being done to produce more benign batteries with lower environmental footprints. But regardless of battery chemistry, recycling is critical for sustainability of energy storage systems, and currently only lead-acid batteries are readily recycled. However, recycling of lithium batteries is available (see ReNew 137) and some manufacturers have take-back schemes for their batteries when they reach end of life. How well each manufacturer actually recycles those old batteries is difficult to ascertain, so we recommend that if you are looking at a new energy storage system then check out the sustainability credentials of each potential system you are considering. You should also ask about other issues including whether the battery will produce any gases during normal operation (most don’t); the embodied energy of the complete battery system (manufacturers should know this, but most don’t supply this information); and the toxicity of any products produced should the battery be involved in a house fire. Don’t expect suppliers to necessarily have all the answers though; you may have to do some research. This article was first published in Issue 141 (Oct-Dec 2017) of Renew magazine. Issue 141 is our energy efficiency and energy storage special.